The pressure is on in Mechanics, as soon they’ll be handing the robot off to the programmers. They’ve finished the first grabber, and work is being done on the second. Lastly, they’re preparing to mount the first climber. The Electronics subteam has managed to complete most of the robot’s electronics. In fact, they’ve even been able to turn the robot on! However, they still have some ways to go as electronics for some mechanisms have not been done and pneumatics are still being worked on. Programming has already written and tested much of the robot’s code. Additionally, most of the autonomous paths have been set up. The programming team now eagerly awaits their turn with the robot. After submitting the Chairman’s essay, Marketing has begun work on the video for the prestigious award. This year, the video will show how Spartronics is helping to grow both FIRST and STEM. Marketing has also completed this year’s entry for the Woodie Flowers award, which aims to recognize excellent mentors.This year Spartronics nomination has gone to fabulous mentor John Sachs. The subteam has also ordered sponsor banners and ensured that new team shirts are in production. Finally, preparations have continued for our 5th annual all-Island Robotics Open House, due to be held on March 14th. One sponsor that’s been supporting Spartonics from the beginning has been Town & Country Markets, a Bainbridge Island institution. For over 60 years Town & Country has served our Island. 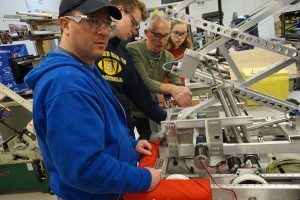 Throughout the last 5 of those years they’ve supported Spartronics with both financial backing and by helping to provide healthy snacks at a discount to our students during our six-week build season. When Spartonics went to the World Championships for the first time, the sign outside T&C has told the entire Island of our incredible first-year accomplishment, and congratulated our team. We want to thank the entire Nakata family and everyone who works at T&C, and especially Rick Petersen who’s always been a great help!